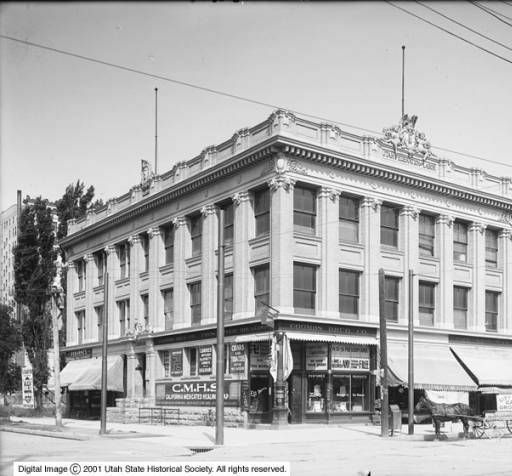 In 1902 Salt Lake's Socialist local held weekly meetings at the Federation of Labor Hall on 69 East 400 South. Every Wednesday night Utah Socialists would come together to sing, dance and discuss the issues of the day. The gatherings were open to anybody, not just Socialists, and invitations appeared in the Utah Labor Journal, as well as the mainstream press. Apparently discussions of labor unions and the importance of voting, the vaudeville-like programs, the singing and the two-stepping were a big draw. At the January 27, 1902 gathering, the hall "filled to its capacity with an enthusiastic audience." 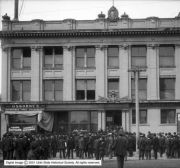 [see Footnote i] These meetings, and the Federation of Labor Hall itself, were beneficial to the Salt Lake Socialist movement both by providing a space for the movement to assemble and by enticing new applicants for the Socialist Party. Any hesitant attendants who heard the sounds of Mrs. Julie Gilbert's Women's Working Class Orchestra, a staple of Federation of Labor Hall events, would realize by the end of the first number that these Socialists were not rabid radicals. At the Federation of Labor Hall, Socialists rallied for labor issues, but they also rallied for a good time. Though the Federation of Labor Hall afforded Socialists a lot of play, it was also the site of serious organizing and decision making for Utah labor movements. Four days after the January 27 event, a union of cooks and waiters met at the hall to discuss a potential strike. [see Footnote ii] A year earlier in February, eleven trade unions met at the hall where they decided to express sympathy with coal strikers and boycott the Pleasant Valley Coal Company. [see Footnote iii] As well as supporting Western Union strikes, streetcar strikes and other Salt Lake and Utah strikes or boycotts, the Federation of Labor Hall was an intellectual hub for Utah Socialists. Socialist/Anti-Socialist debates were held at the hall and nationally renowned orators such as George R. Kirkpatrick, Charles E. Randall and Harry McKee railed against the ills of capitalism there. For a short time William Thurston Brown utilized the hall to accommodate his fast growing Modern School, a free school that provided anti-capitalist, anti-authoritarian classes and lectures meant to instill values of liberty, equality, and social justice in adult students as well as children. That Socialism, an anti-capitalist, anti-religion movement, thrived in Utah counters a widely held belief that the state is and has always been dominantly conservative, capitalistic, and religious. But Salt Lake Socialists did survive despite their neighbors. In 1905, just a few blocks from the Mormon Temple at the Federation of Labor Hall, the Social Science Club held a meeting on the subject "Does the Church Help the Labor Movement?" The Federation of Labor itself denied a request made by the Salt Lake Ministerial Association for two of its members two join the federation as "fraternal Members." They reasoned that churches in general tended to represent the interests of employers rather than those of workers. 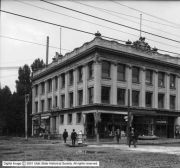 [see Footnote iv] Even more startling is the fact that the Salt Lake Stock and Mining Exchange, part of a developing capitalist center known as the "Little Wall Street of the West," was located just around the corner from the Federation of Labor Hall, on the very same city block. The hall opened up an alternative space for Salt Lake citizens – a political hotbed, an intellectual hub, an educational center, a concert venue, a dance hall – that was emphatically liberal in the face of Salt Lake's conservative religious and economic ideologies. The majority of this piece was written using information found in A History of Utah Radicalism: Startling, Socialistic, and Decidedly Revolutionary by John S. McCormick and John R. Sillito. Deseret News – Feb 2, 1901: "Will Boycott Coal Company." Deseret News – Jan 31, 1902: "Proprietors Will Not Arbitrate"
Deseret News – Aug 9, 1907: "Western Union Telegraphers Walk Out Today." 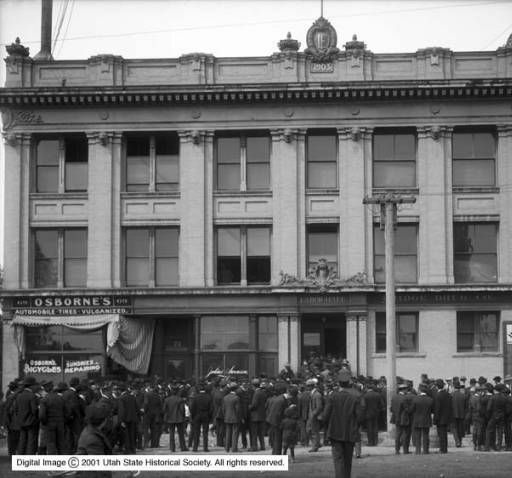 Photos of the Federation of Labor Hall from Utah Division of State History. ii Deseret News – Jan 31, 1902, "Proprietors Will Not Arbitrate"
iii Deseret News – Feb 2, 1901, "Will Boycott Coal Company."